For the cost of paying a guitarist for a night or two, the Fishman Fission Bass Pedal lets the bassist take over rhythm guitar duties for many applications, from rock to metal and beyond. A pedal that replaces a rhythm guitarist or allows a player to gets the sound of an 8/12 string bass without the cost of a specialized instrument may sound like a thing of myth. However, this pedal is here and absolutely works as advertised. 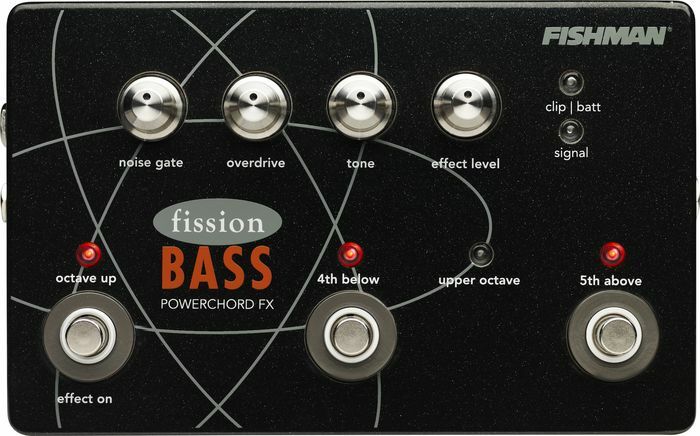 The Fishman Fission Bass Powerchord FX pedal is a sizeable pedal, almost 5 inches wide and 7.5 inches long. There are 4 knobs controlling the noise gate, overdrive level, tone and effect level as well as a number of LED’s. There is a clip/battery indicator LED and signal LED beside the controls as well as LED indicators for Octave Up, 4th below, Upper Octave and 5th above. There are footswitches that directly control Octave up, 4th below and 5th above, however the Octave up toggle also controls the effects being on or off as well. There is a single ¼ in.input with a inset trim control to get input at the optimal level. Outputs include a mix output and an effect output. When using a separate amplifier for the effect signal, only the bass output comes out of mix output. The case is constructed of sturdy metal and there is a 9 volt battery that is easily accessible from underneath and there is a pedal board friendly 9v input, however the sheer size could be problematic for some people’s pedal boards. Fishman claims 27 hours of battery life, which is impressive considering just what this pedal is doing. Testing this pedal was a 2 part affair. First test was plugging it in at home and trying it out through a small keyboard amp I have lying around. I did this so I could try the pedal through the mix output as well as take out all of the original bass signal to listen to the quality of the effected signal. I used both a Schecter 6 string bass as well as a Traben 5 string for these tests. Both basses have active preamps but very different characters. Both basses sounded exactly like they do normally when plugged in and the effects off and the trim affects the input to the pedal but does not affect the output of the bass. Good start, for sure. Running the pedal in any configuration of intervals available, through the mix output only and no distortion yields a sound more akin to a multi-course (extended range) bass, rather than a guitar/bass guitar playing in unison. Cool bonus feature for me but for some who want clean power chords, it could be an issue without a separate amp or signal chain. Running the effect signal by itself, it sounds pretty good clean and would be a great place to start for someone wanting to add their own effects to the signal chain. It’s a pretty hot output, with plenty of additional output available through the effect level knob. (To my ear, the balance between the effect and my signal was between 9 and 10 o’clock). Adding distortion, either through the mix only signal or the separate signals through the overdrive control is easy and straightforward, though not the best quality overdrive. There is plenty of gain to be had but the natural tendency is toward brightness. By the time I was done tweaking with the second part of the test, the tone was turned almost all the way down, in the 9 o’clock range. I’d almost consider running clean into a separate signal processor for some applications, especially if I needed clean and distorted effect tones in the same set. Regarding my other quibble listed in the Cons: To get the effect to produce a 3-string power chord above the bass note requires pushing the 4th down and 5th up buttons at the same time. The problem here is that these buttons are quite far apart. From center of each switch, there is almost 3 inches of distance. My size 13’s in boots was sufficient but in testing at home barefoot, I needed to hit them at an angle and I can’t help but think that a narrow, more feminine foot might have problems. It also makes me think there is room on this big box for another switch, either for distortion or to add the top octave with a separate switch. The initial at home testing lead me to believe I had the pedal mastered and decided to use it for a couple sets of music that I was already scheduled to play that evening at a local rock venue. For this, I used my bass amp for the bass and took along the Kustom Defender 15H Head and Cab to amplify the effected signals. The sound guy looked at me a bit funny, mostly because I’ve played there a number of times, but went along with things. He opted to use the Kustom’s DI which let me put the Defender cabinet up higher so I could hear it on stage without running the amp at “11”. Both covers and originals benefited from the Fishman throughout the night. The Fishman Fission Bass Powerchord FX pedal doubled the octave, with distortion, on Megadeth’s "Headcrusher" for the intro to fill in a rhythm guitar part that we don’t have and tracked perfectly. Mind you, that’s 16th notes at almost 160bpm’s and I was using fingers, not a pick for this. Our originals benefited as well, allowing me to use the Octave and Octave and 5th up switches to fill in lost guitar parts during solos. I even was comfortable enough with the pedal that I was engaging the 5th up switch so it fit the guitar part perfectly on one solo in particular. Thanks to the economy and competition, the cost of a 2nd guitarist can be the cost that takes their profit margin from barely making it to not worth it. For many bands, the Fishman Fission Bass Powerchord FX pedal could easily give the bass player the ability to fill those holes. On top of this, it is a great way to experiment with a multicourse bass without the serious investment of money as well as time learning the unique techniques required to play them well. The cons to this unit are minor and the pros make it a worthy addition for any bassist.